It's funny. You read appliance articles and blogs to better inform yourself. Appliances articles and writers love everything. When was the last time you read a blog from a retailer or manufacturer and they said, "Do not buy this" (except here)? Yet, most review forums hate every product. In fact, there are tons of sites like "Pissed Customer" designed for you to vent about products professional reviewers supposedly love. Samsung is a lighting rod for both praise and criticism. Perhaps more than any other brand because of its popularity. In this article, you will learn about the features of Samsung's most popular refrigerator, the RF23HCEDBSR. You will also learn when to buy this refrigerator and when this refrigerator SHOULD NOT be a consideration. I am not a huge feature-oriented guy. It's more important to pick out the unique features than saying, "It has crisper bins." This refrigerator does have bright LED lighting and pantry-style crisper bins like most counter depth refrigerators. It also has an ice AND water dispenser for this price whereas most only have an ice maker inside the refrigerator. Still, this Samsung refrigerator has three unique features to consider. Let's take a look. 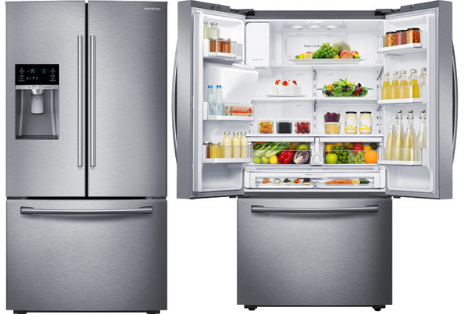 First, Samsung engineers a better refrigerator. It has Twin Cooling with two separate environments, one for the refrigerator and one for the freezer. Sub-Zero built a company on a similar story. 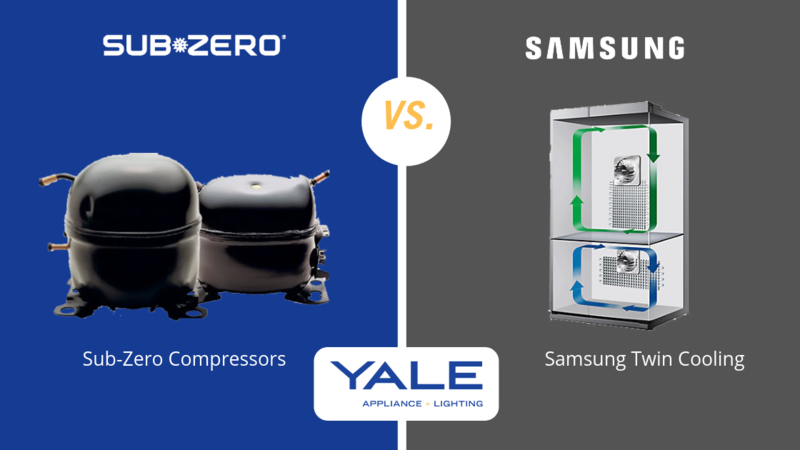 They do use two compressors whereas Samsung has two evaporators. Your food will taste better in a Samsung because the moist, cooler air of the refrigerator will not mix with the colder, drier air of the freezer. If you have fresh fish, funky cheese or any other aromatic food, the odors will not be trapped in your freezer. Think about a fresh fish odor in your Butter Pecan ice cream. You will also have less freezer burn on your food and less defrosting of your food because you are ot forcing warmer air from the refrigerator to the freezer. Please keep in mind, we removed any brands where we shipped fewer than 3 models in 2017. However, at 16% it still needs quite a bit of service for a new product within the first year. We will return to that in a bit. Samsung is also the most competitively priced refrigerator on the market. You can save $200-500 between this Samsung and a comparable KitchenAid. When is the best time to buy a Samsung refrigerator? It may be hard to wait to buy with a broken refrigerator, but, Black Friday, Columbus Day, Memorial Day, Independence Day, and President’s Day are the best times to buy an appliance. The savings can be 10-35% depending on the promotion. Samsung is the most reliable refrigerator. However, their ice maker will need to be repaired like the others over time and almost certainly within 3-5 years. Samsung went from nowhere 10 years ago to being the number 1 sold brand last year. There are issues with support from that type of expansion. Samsung does not have techs on the road per se, but works through independents. Harder repairs could be a problem. It is not any harder to fix a Samsung than any other brand. That is usually the story you will probably hear from dealers across the country. Their parts are also stored in New Jersey like other brands, not from Korea, which is another story you will probably hear. So before you buy a Samsung refrigerator (or any other premium brand) you have to figure out who will be fixing your refrigerator first. For features and price, the RF23HCEDBSR is definitely worth a look, especially around a promotional holiday. However, make a few phone calls about service first, rather than finding out later with a non-working refrigerator. 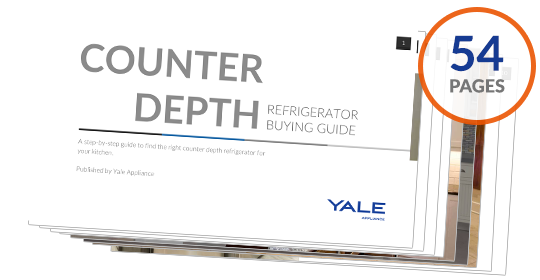 Download the Yale Counter Depth Refrigerator Buying Guide with features, specs, and inside buying tips for regular, pro, and integrated counter depth refrigerators. Well over 355,000 people have read a Yale Guide. Why Don't Appliance Retailers Service Their Products?